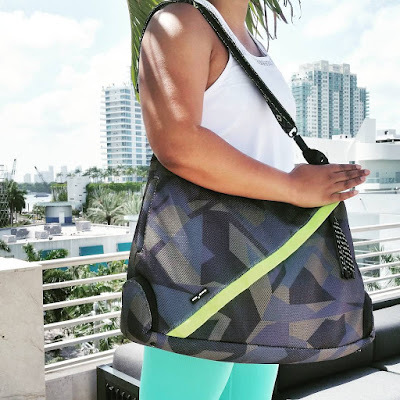 As you may have read in my last post, I absolutely love grains! Not only that, but I fell in love with freekeh after giving it a try this summer. One of my favorite ways to eat grains is by taking chicken and vegetables, creating a sauce, and pouring these ingredients on top of the grain. Freekeh is no different for me. 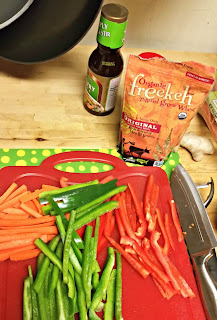 When I got to thinking about flavors that would go well with freekeh, I decided that stir fry definitely had to be at the top of the list. I learned how to make stir fry -- mostly through trial and error -- when I was a kid, and I've modified my recipe a bunch over the years. 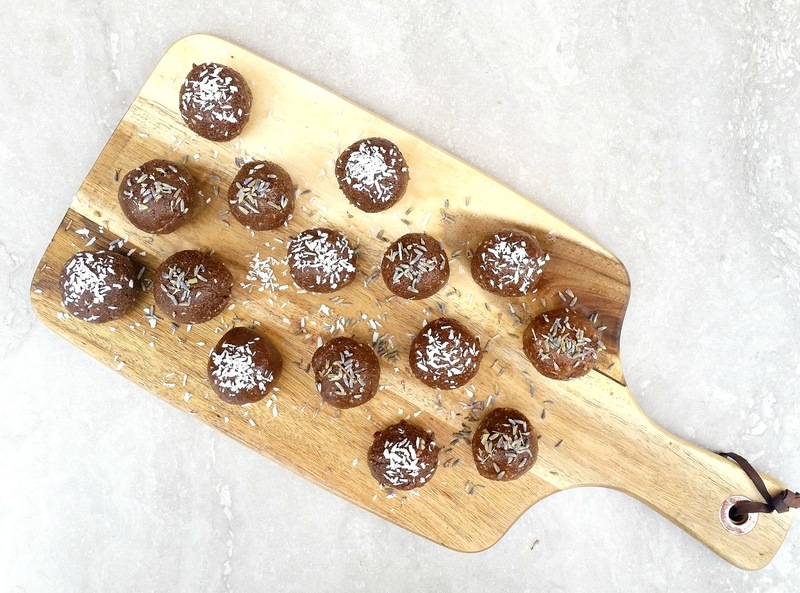 Fortunately for you, I actually wrote down the ingredients as I went along, that way I could share a quick, easy, and delicious meal with all of you! For my Chicken Stir Fry Over Freekeh recipe, I've left you with the option to add a little more or a little less kick, a more sweet or a more savory sauce, and lots of yummy veggies! As I mentioned, I often mix up my stir fry. I don't think I've ever made the same stir fry twice! 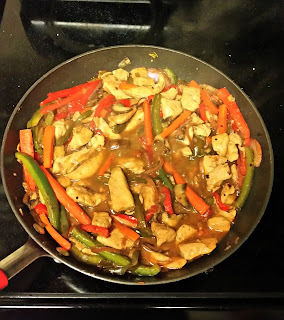 This version of my stir fry is a good balance of sweet and savory, as I opted for hoisin sauce and stir fry sauce over soy sauce -- the only sauce I usually use for stir fry. Enjoy! Prep veggies and chicken separately. Mix veggies in a bowl, and toss with canola oil and hoisin sauce. Add salt and pepper if desired. Combine all ingredients (minus the canola oil) for the chicken in another mixing bowl. 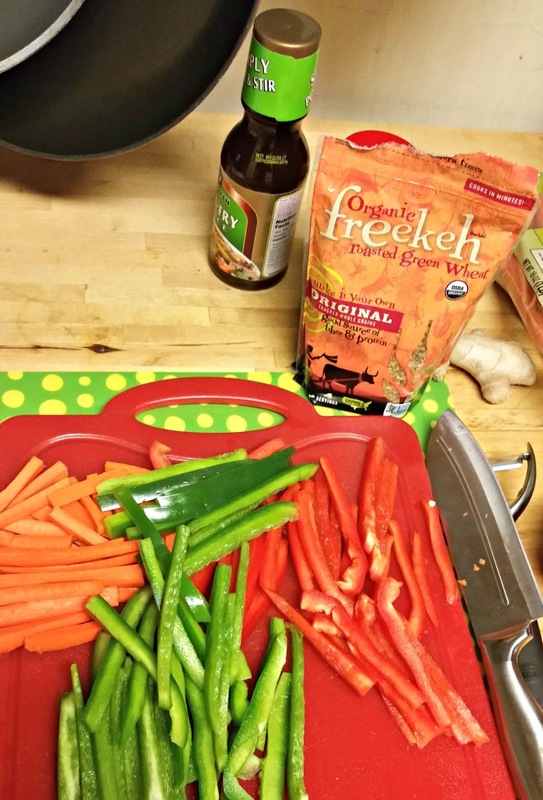 Add water to freekeh and begin the cooking process. Saute vegetables in a pan or wok. Continue stirring vegetables while cooking. Taking a quick break from stirring the veggies, add canola oil to a fresh pan, and begin cooking chicken mixture. Combine chicken and vegetables into the vegetable pan. Add any additional sauces desired while adding the finishing touches to the stir fry. Check freekeh. It should be just about done at this point. Remove all ingredients from stove once cooking is complete. 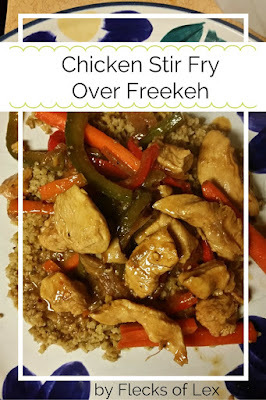 Serve the dish by putting the stir fry over the freekeh.